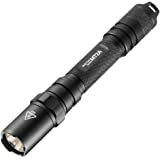 BRIGHT AA FLASHLIGHT - The NITECORE MT20A is the most powerful AA powered flashlight that produces 360 lumens output with 175 yards beam distance. SIMPLE TO USE - Press the tail cap to turn the light on and off. Half press the tail cap to turn the light momentarily. 5 BRIGHTNESS SETTINGS - Side mode switches cycle through 5 different brightness levels for versatile usages from reading, searching, work to self defense! The previously used brightness is memorized even after the light is turned off. 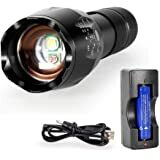 RED LIGHT + SPECIAL MODES - Its secondary red light preserves night vision for photography, star gazing ad map reading while it SOS, Strobe and Beacon modes are indispensible in emergency situations. Red can also be set to blinking for alerting and signaling! Carry light everywhere with the NITECORE MT20A 360 lumen LED flashlight. 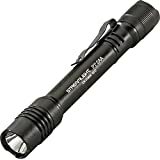 This slim, pen-style flashlight has a removable pocket clip and can comfortably tuck into pockets or bags for everyday carry. You'll find endless uses for this powerful tool featuring a CREE XP-G2 R5 LED capable of 360 lumens max output and 175 yards throw. 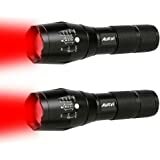 Use the tactical tailcap to access momentary and constant illumination and the conveniently located mode switches to cycle through 5 brightness levels plus a secondary red output. 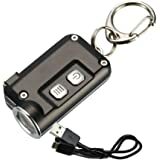 There's even SOS, Beacon and Strobe modes for emergencies! Powered by two easily sourced AA batteries, the MT20A runs for up to 180 hours on low and up to 1 hour and 45 minutes on high. 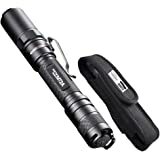 Constructed from durable anodized aluminum and rated IPX8 for waterproofness, this flashlight is ready for daily use. 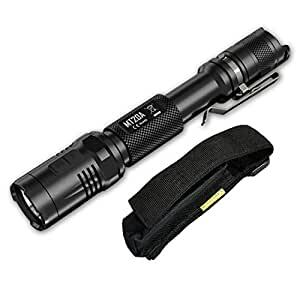 4.0 out of 5 starsGood quality AA batt flashlight from Nitecore. This is the 3rd Nitecore flashlight I've purchased and (fingers crossed) have yet to have any issue with any of them. The other 2 Nitecore lights I have utilize the 18650 rechargeable lithium batteries, however this MT20A uses 2 AA batteries. This is nice because it's much easier to find AA batteries in a pinch instead of waiting to charge up a depleted 18650 or try to find one in a store (not likely). Construction is good, as is to be expected from Nitecore, and the light is plenty bright for day to day tasks. I don't have any fancy lumen measuring equipment but I don't have to measure to know that it won't be anywhere near as bright as my other 18650 powered lights. That's just a limitation of how powerful AA batteries are. It's not a blinder by any means, but it does the job well. Good for keeping in the car or bag. The size is nice, not too small and not too bulky. 5.0 out of 5 starsTiny but powerful flash with Nitecore quality! This is a great flashlight, as one would expect from Nitecore. Sometimes one just needs a tiny light that is easy to carry around and uses standard batteries. I particularly like the up and down feature where you can adjust brightness in both directions without cycling through all settings! I have not experienced any problems with this light. It has met or exceeded my expectations in every area. Love this flashlight Over My Fenix pD35 Only Because Of The Red Beacon And Strobe On Beacon....Also Love The Strobe On The White light Cause It Blinks Every Couple Seconds Over My Fenixs All in One Strobe And Sos....And the Fact It Has 2 AA Batteries That Last A Very Long Time For there Size Versas Say The 123s Or the 18650...I'm Very Satisfied Having This Light In My Small Collection!!!! "good" for the home environment....Didn't survive more than a 2 weeks in the field (sleeping outside in sleeping bags only). This product would be better if the button that switches the modes was more reliable. During the deployed training phase I had several issues with being unable to change the light to red lens causing issues with light discipline. Thanks for the product that uses AA batteries, but I am unable to use a product in the field that is inconsistent in performance. 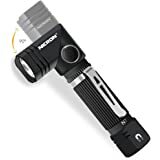 I purchased this to replace a lost Streamlight. 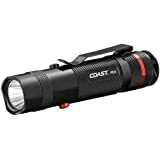 I was impressed w/the fearures of this light, but apprehensive due to lack of experience with this brand. Order showed up early and in tact. Glad i ordered it. SOLID light! Owned it now for abt 4 mo. Dropped, banged and even gotten wet. No subsiquent damage. Lumens are above standard. Functions as described. One of my EDC items. Takes abuse and keeps working. Highly recommend. Would absolutely purchase again.